What’s in the bag? 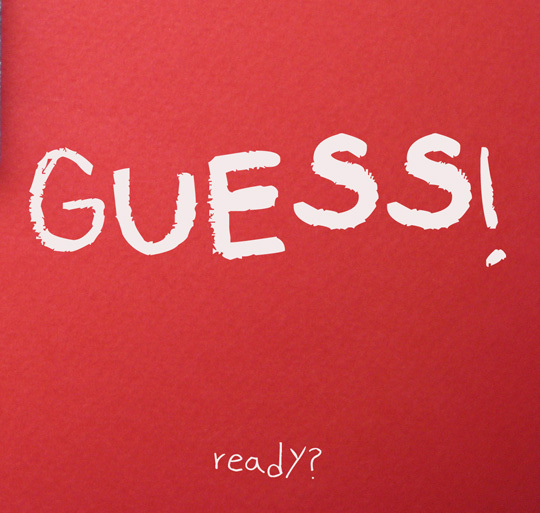 … Guess! First hint: it’s not a sheep that will eat baobab tree shrubs. Another hint: it’s edible. At least, it’s supposed to be. Third and final hint: it’s in the bag for a purpose and not as an idle loafer. So! Any ideas? What in the world do you think is in the bag? Now that you see what’s in the bag, do you know what it is? If you do, you have one on me. Because until last week when I traipsed over to Sahadi’s (to buy chickpea flour, I’ll tell you another time why) I had never laid eyes on such a thing. I thought maybe they were plums at first.The nice dude working there joked that they were olives (I believed him!) but then confessed they were dates. Dates! 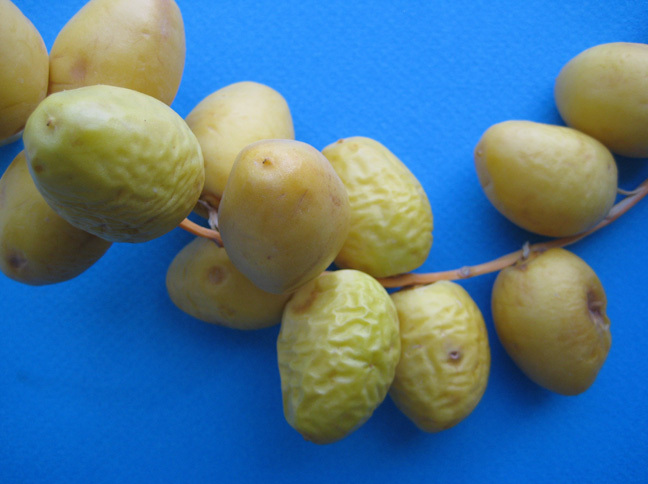 Young fresh dates – grown in California and imported to Brooklyn. He invited me to sample a taste and I happily took him up on it and bit into one and it was … not good! Raw and sour and that astringent type of taste that makes your mouth pucker, just like an unripe persimmon might. Still, how could I go home without my very own super-cute twine of dates? As a garden-deprived urban dweller, any hint or simulation of proximity to nature and our mother earth is a beguiling prospect. Plus, the guy told me I could put the dates in a paper bag and let them ripen, just like you would with a banana. and when I bite into one: still astringent and puckery! DARN IT! Even though dates are used in Iranian cooking, I’m stomped as how to use these tart young ones. We do have a yummy lentil rice called adas polo that can be layered with sauteed raisins and dates; and there are these Kermanshahi soft-cakes called “kooloocheh” (isn’t that the cutest word?) that have a date paste filling (God do I miss eating those; when my father’s family visited Tehran they’d sometimes bring some as soghati aka gift ); and of course there’s a delicious and simple Persian sandwich or loghmeh called noon va panir va khorma that’s made by pairing dates and feta and a soft lavash type bread that goes oh so nicely with hot tea and is a perfect winter time lunch fare; and there is an almsgiving tradition of donating trays filled with pitted dates stuffed with almonds; and awhile ago I found a very interesting Iranian recipe for a date torshi (alas it entailed a deal-breaking step so thank you but no thank you) but I can’t think of any Persian recipes for fresh dates. Internet to the rescue! I Googled “what to do with young dates” — a search query that seems rather perversive and suspect, ha ha — and landed on a cool Taste Spotting blog post with a recipe for candied dates with cardamom, which actually sounds quite awesome but more suitable for winter and also I’ve been making a ton of moraba and sharbat recently for an upcoming non-profit event and I am kind of over making syrupy things for the moment and instead would vastly prefer to make this fabulous-sounding Asian pear, fresh date and pomegranate salad – that is if my dates play along and go ahead and ripen. I’ll give it a few more days. 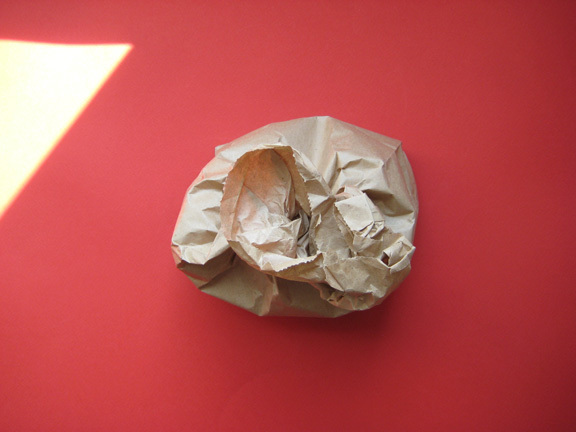 So, as of now, the dates go back to their paper bag residency and their future is in limbo. Any tips or tricks for encouraging the dates to mature and grow up already and/or recipe suggestions are most welcome. Meanwhile, dates do their daily cardio. Dates need their endorphins too after all. ps My mom tells me that in the olden days people would give these yellow dates to babies as a teething toy! Were they trying to kill the poor babies with the astringent puckery taste? I wonder out loud. My mom gives me a negaheh aghel ander safih (the look one gives when dealing with a particularly foolish person) and says: “Azita ‘ye azizam (which means ‘my dearAzita’ and oops, I’m in trouble when she calls me that) ours tasted very good and was soft and sweet.” OK! This fool stands corrected! But California dates can learn a lot from their Persian cousins is all I’m going to say. Hmmmm….. never had fresh dates before. Doesn’t sound altogether pleasant and reading this reminded me of the first time I bit into an unripe persimmon when I was a child and to this day I can still taste it and that horrible mouthfeel, YUCK!!! They are pretty and look really nice (not the puckered ones) I love Sahadi’s, can’t wait to see what you do with the chickpea flour. that puckery taste is the worst. Yuck is right. Re chickpea flour: I attempted to make shami kabab with it – expecting it to be a super easy affair and lo, it was basically a disaster. I have never heard of shami kabab. Sorry it was a disaster. I have had my fair share of disasters. 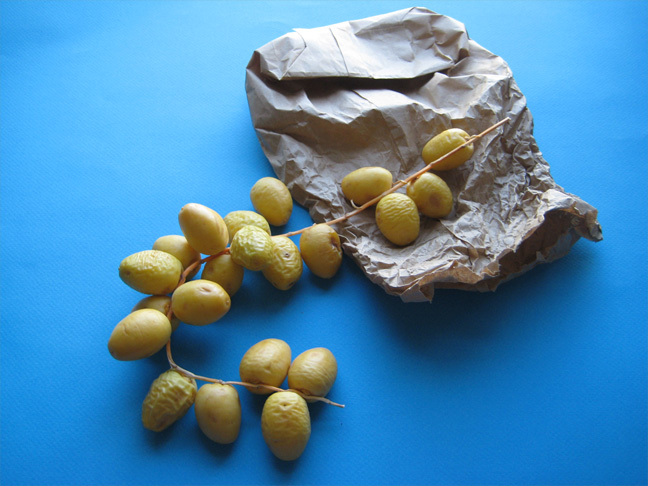 Are you sure that they are not jujubes aka “Chinese Dates”? 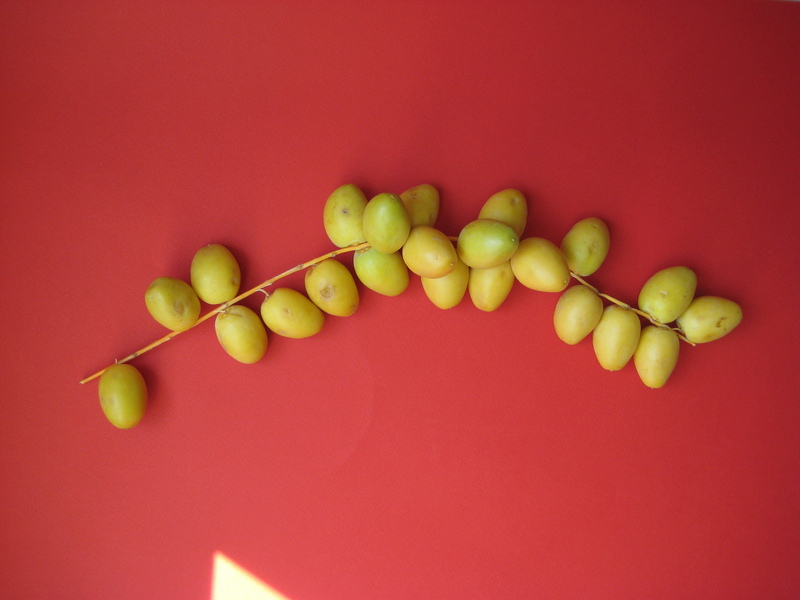 I have bought fresh semi ripe (more so than your pictures) jujubes and they had some small degree of astringency. Dried Chinese Dates/Jujubes, as found packed in Asian supermarkets, are sweeter than fresh but not as much so as Medjool etc. dates. 100% positive they are dates. Unless the people who imported them to Brooklyn from California and sold them as such in a box marked “California Dates” were playing a trick on the store owner. BUT based on that illustration, I can totally see the eerie similarity. 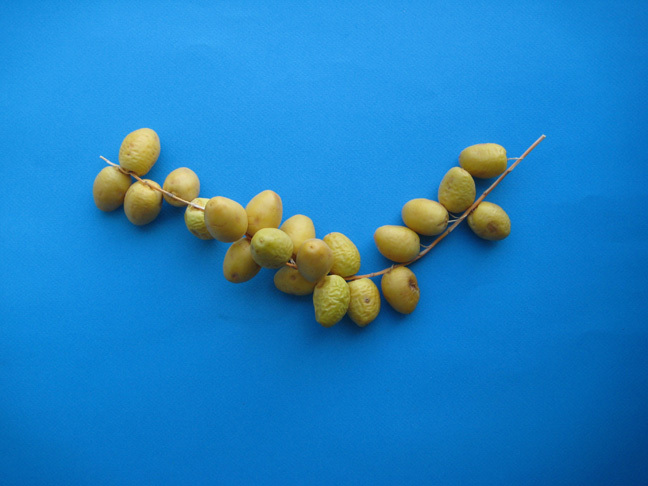 These dates are supposedly known as Bahari dates or yellow dates. So funny! And very interesting! Haha, love the dance! Thank goodness for the internet right? I’ve come home with produce from the market or CSA on several occasions with no clue what to make, then internet to the rescue. Good luck with them! By the way I would have guessed olives too. Or maybe young chestnuts? And been totally off. I’ve actually seen fresh dates before, but never tried biting into one, as greedy as I am. Good thing I didn’t. Unless of course the ones I saw were Persian, then I missed out on tasting sweet fresh dates! Hah, similar to the time I walked into a fruit market and saw a sign advertising “Loose Dates.” Great post! I so love the fresh dates. Nice read!! love this one too! can’t get enough of these puns. I would have gone with an exotic berry. Never with young dates! 😉 I enjoyed your “dates’ odyssey”: enormously entertaining. It’s always a pleasure reading your posts, Azita. I thought it was some sort of kumquat. Would have never guessed it was dates. Funny! Kumquats are a fruit that I’ve encountered on food blogs but have yet to cross paths with in real life and am truly intrigued to try. Azita, I loved the dancy-jiggly-thingy you do with your graphics! So cute! I tasted fresh dates for the first time when I went to Dubai last year, and they were divine! They had hundreds of varieties, all with slightly varying tastes…some soft, some crunchy, all delicious! Its so sad that yours were raw and astringent…hope they sweeten quickly. We normally put mangoes to ripen in the rice container. You could try that with the dates. 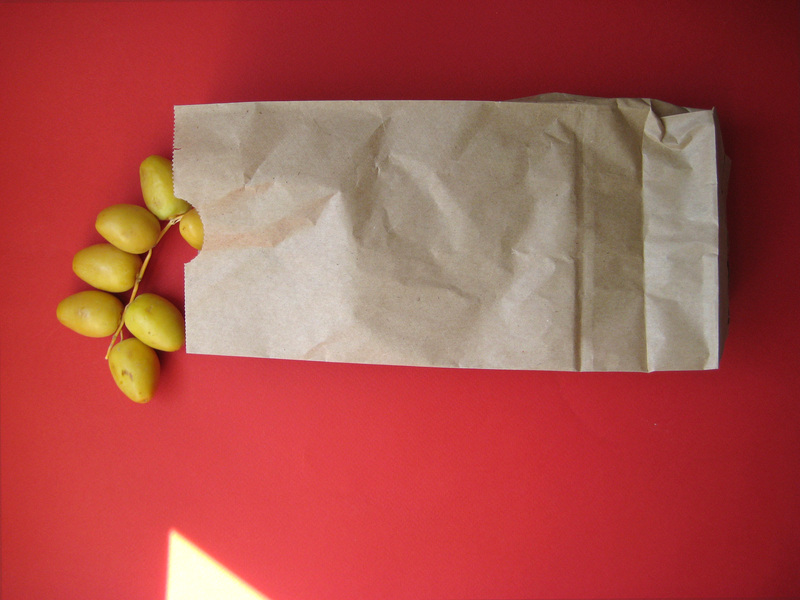 Or put a banana in the paper bag…hopefully the dates will ripen quickly. And regarding ‘besan’ or chickpea flour….a plethora of Indian desserts and snacks are made with it. Check out the onion pakodas on my blog. You crack me up woman! the dancy-jiggly thing with the graphics is called an animated Gif or Gif for short but going forward I will forever think of it (to myself not outloud with clients) as the dancy-jiggly-thingy, ha ha , love it! So cool about the banana technique I didn’t know that putting in a banana in the paper bag would expedite ripening. I’ll definitely keep that trick in mind. And I like the rice technique as well. How cool is that? Love that with this Internet-thingy we can exchange info like these. Priceless. Love the scene you paint of the dates on display in Dubai. I honestly had no clue that there were so many varieties of dates. Envy you your experience. Madjool dates are prevalent here in the markets. As my chickpea flour creation was a disaster I’m more than motivated to check out your recipes to put my flour to use. I’ll go check out onion pakodas. Najmieh Batmanglij is an icon and idol. Love her! thank you for your comment – rich in context as always! Next time I talk to one of them, I shall astound them with my new found knowledge! “Can you help me tweak my animated GIF?” Hahaha! I am imagine the surprise on their faces! Chickpea flour (that’s a huge mouthful) or besan is used to make a million different pakodas/pakoras, bajjis or fritters. Sieve a cup of it to remove lumps, add salt and chilli powder and a 1/4 tsp of baking soda. Add water to make a smooth thick batter. Then prepare your veggies of choice. Use a mandolin slicer and cut raw potatoes into thin slices. Leave the slices in water until you are ready to fry them. If using cauliflower, cut into bite sized florets. Likewise bell peppers. Put 1 cup of oil into a wok and heat it. Test the temperature by putting a tiny bit of batter in the oil. If it sizzles and rises, the oil is hot. Then dip your veggies in the batter and drop them in batches into the oil. Fry, turning occasionally, until golden. Serve with tomato ketchup or a green chutney. Write to me if you need any more tips. what do kids know? it takes a poet to call a tech thing a name that one happy to hear. I’m telling you that’s how I’m going to think of those from now on. I was gonna guess black limes! Aw, shucks! You make me blush. But seriously, have you ever used black limes? I haven’t but the Turkish shop near where I live sells them and I really want to buy a basket. I just don’t have a recipe. Timely question b/c I’m working on a black lime post (who knows when it’ll be posted though) … did you see this Khoresh recipe? It uses them: https://figandquince.com/?s=karafs but also, you know Padma Lakshmi of Top Chef? I heard her give a really good tip about using one or two of black limes in soups and stews for an added tangy (a teeny tiny bitter as well) flavoring. Just wash it, dry it well, puncture with knife, drop in soup/stew etc. It does have a strong flavor so start with one and make sure you and your family like it first and work your way up. Aside from imparting flavor, once it’s softened when cooked, it can be eaten as well. It’s super yummy in Persian stews, you’ve gotta try that sometime for sure. I love this post! Made me laugh. I’ve never used young dates, but I hope they shape up for your salad. Looking forward to hearing how that turns out. Dear Mary Frances, thank you for visiting and commenting and I’m pleased it gave you a chuckle! I always wondered what fresh dates looked and tasted like, now I know, thanks! A friend recently gave me a gift of Vonya dates. I am hooked! Totally in love with them, now I will have to bribe him into buying me some more. Once you have a great date you never want to have the ‘others’. Hi Patty! I have to say that now that a few more days have passed (going on 10 days since first purchased) they have started to ripen and one in particular ripened fully, turning brown but with a soft skin and the flesh was like candy! Wow, wow, wow! So that’s how fresh dates look! Thank you. They are super cute, right? I hasten to add that these are Bahari dates, sometimes called yellow dates, so am not sure if all dates look like this when young but this particular type does. – Isn’t it amazing how we learn/see new thing(s) everyday. 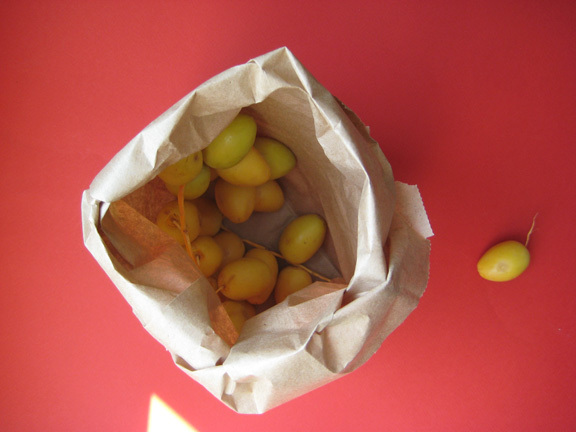 – I had fresh dates before and they were ripe and delicious. There are varieties of them and even when you buy dried dates, there are juicy ones with more flesh and then there are ones that are dried up with annoying stringy fibers with some bitterness left in them. And of course, substantial difference in price. You are so right Fae about those stingy stringy dates, I’ve definitely had my fair share of those and have been grumpy about it too! I honestly had no idea however that there are so many different types of dates … who knew? A few of the dates have ripened and I ate one and it was soft and really delicious – like candy. Well isn’t that something? I would never have known what they were…except I found a new spice market in town yesterday and they had fresh dates at the counter, the lovely lady even let me try one! dear Celia, I’m a little bit sad about that too! I have to tell you I relate to almost every single character in that book from the pilot to the rose to the fox to the station master! Thank you re the blog. I truly value the compliment. 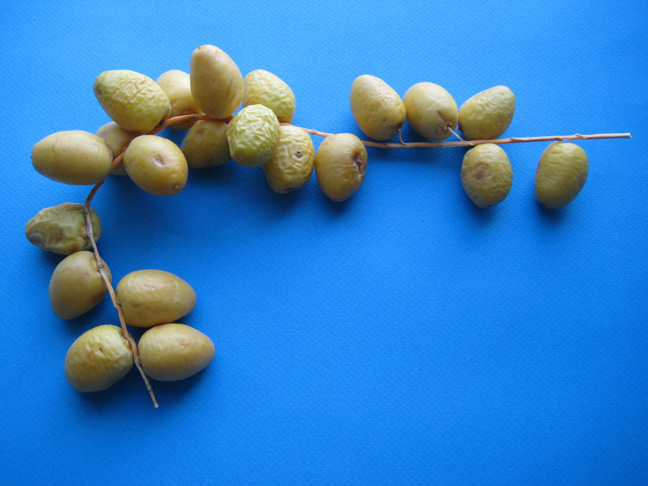 So sorry your young dates were so unripe and sour. Here these are called balah and they are sweet, crunchy and very tasty.